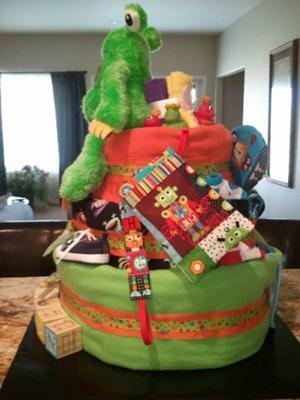 This was a very fun cake to make. 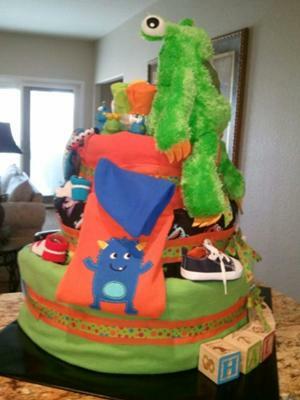 The items are as follows: 96 diapers, size 3; two different ribbons - size and color; 3 homemade flannel blankets (double-sided, different fabrics and colors - one with monsters); small and large rubber bands; small wooden dowels to stabilize the cake;pee pee tee pees, paci holder; paci pod; onesie with monster and skull cap; tennis shoes; sesame street booties (Oscar and Elmo); wash cloths; rubber bath monsters; bib; and for the topper, a stuffed monster. 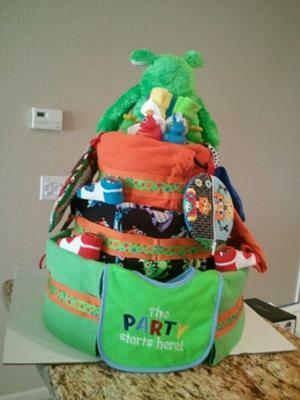 After rolling the diapers make three tiers and secure with large rubber bands and dowels to stabilize and set on piece of cardboard wrapped in colored paper; wrap the tiers with the three different blankets (folded to size); tie the ribbons on each tier and apply your different items for decoration. May need to secure with pins.